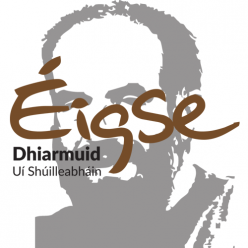 Eigse Dhiarmuidin – Féile Amhránaíochta & Ceoil i gcuimhne Dhiarmuid Uí Shúilleabháin a reáchtáiltar gach bliain i Cúil Aodha and Baile Bhuirne, Gaeltacht Mhúscraí, Co. Chorcaí. 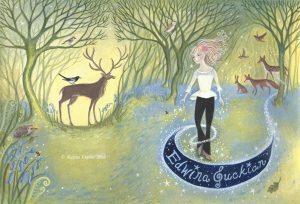 Cuirfear tús le hÉigse na bliana seo ar an Aoine mar is gnáth, an 30ú Samhain, in Áras Éamon Mac Suibhne i gCúil Aodha ar a 8.30 i.n. Táimíd ag súil le trí lá taithneamhacha spórtúla a bheidh lán de cheol , d’amhránaíocht, de rince agus de spraoi . 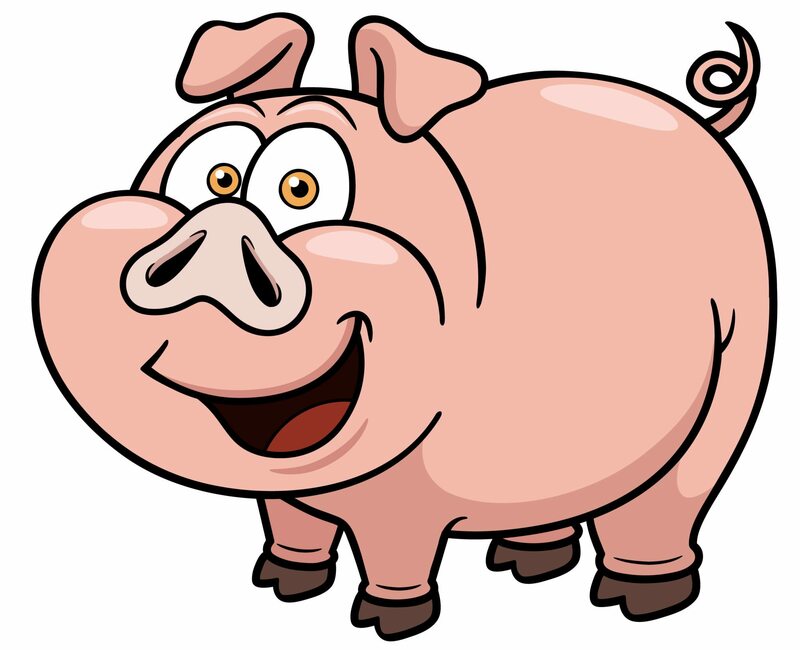 Beidh oscailt na bliana seo an-speisialta mar is iad deirfiúracha agus deartháireacha Dhiarmuda a bheidh sa lárchéim don oíche. 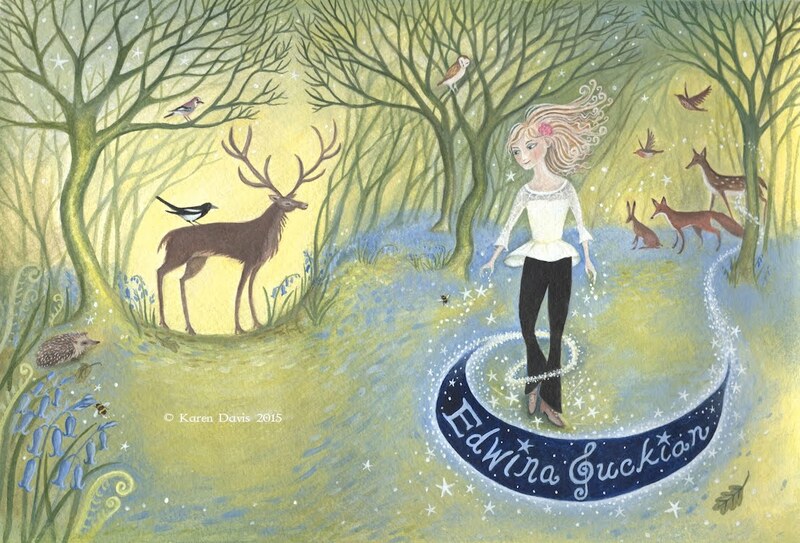 Roinnfidh Eilís, Nóirín, Máirín, Danny agus Eoiní cuid dá gcuimhní cinn ar a ndeartháir, Diarmuid, i gcomhrá le Seán Ó Liatháin, buan-chara le Diarmuidín é féin. Cuirfear tús le CUIMHNÍ CINN MHUINTIR SHÚILLEABHÁIN ag a 9.00 i.n. agus beidh fíon is cáis ar fáil mar is gnáth. Tá súil againn go mbuailfidh sibh go léir chugainn i Múscraí mar a mbeidh na mílte fáilte romhaibh. Tá Clár na hÉigse ina iomlán ar fáil anseo. Tá liosta de cheardlanna agus múinteoirí Éigse 2018 foilsithe ar líne anseo. Bíonn an-ghlaoch ar cheardlanna na hÉigse gach bliain, dá bhrí sin, moltar áit a chur in áirithe chomh luath agus is féidir. Tá na ranganna seo á n-eagrú ag Coiste na hÉigse i gcomhpháirt le hIonad Cultúrtha an Dochtúra Uí Loingsigh agus le Coláiste Ghobnatan, Bord Oideachais agus Oiliúna Chorcaí. 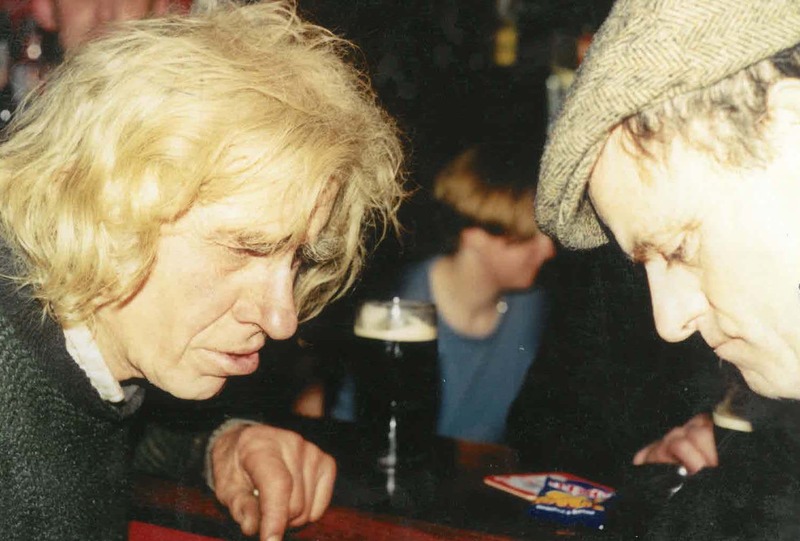 Beidh Éigse Dhiarmuid Uí Shúilleabháin ar siúl arís i gCúil Aodha / Baile Mhúirne ón 30ú Samhain go dtí an 2ú Nollaig. Mar is gnáth, táimíd ag súil le trí lá taithneamhacha spórtúla a bheidh lán de cheol , d’amhránaíocht, de rince agus de spraoi. Beidh an t-eolas go léir á chur ar an suíomh do réir a chéile as so amach. Tá súil againn go mbuailfidh sibh go léir chugainn i Múscraí mar a mbeidh na mílte fáilte romhaibh. Féile amhránaíochrta, rince agus cheoil i gcuimhne Dhiarmuid Uí Shúilleabháin, amhránaí, d’éag 1991. Beidh na himeachtaí ar siúl i gCúil Aodha & Baile Bhuirne i nGaeltacht Mhúscraí, Co. Chorcaí ón 30 Samhain go 02 Nollaig 2018. 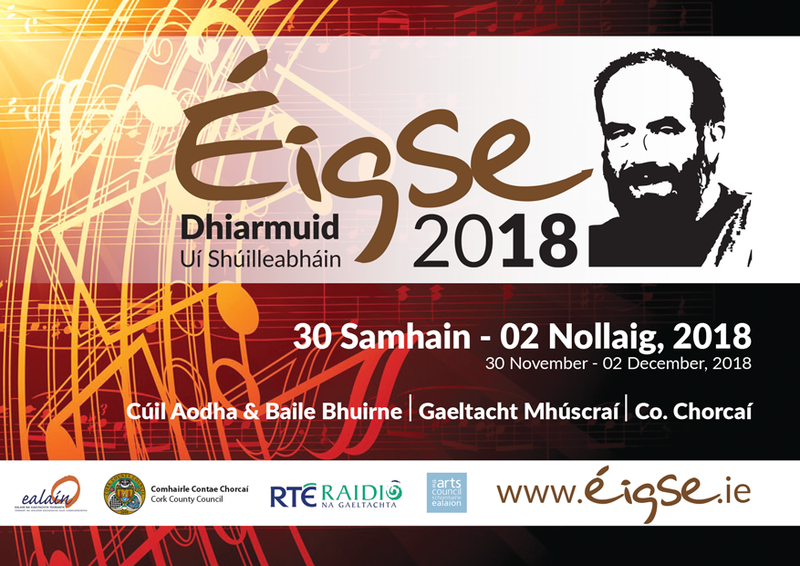 Éigse Dhiarmuid Uí Shúilleabháin will be held in Cúil Aodha & Baile Bhuirne in the Múscraí Gaeltacht of Co. Cork from 30 November to 02 December 2018. 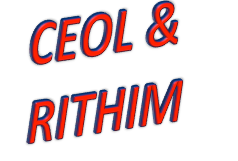 Tá gliondar orainn gur tháinig 48 rannta nua chumtha do phásití óga chugainn os na scoileanna i Múscraí agus do roghnaigh Coiste na hÉigse 12 ceann samplach le ceol a chur leo agus tá siad sin seolta chuig na ceoltóirí a bheidh ag teagasc na ceardlanna maidin Dé Sathairn. Seo sampla de cheann amháin go bhfuil ceol curtha leis ag Johnny Óg Connolly. 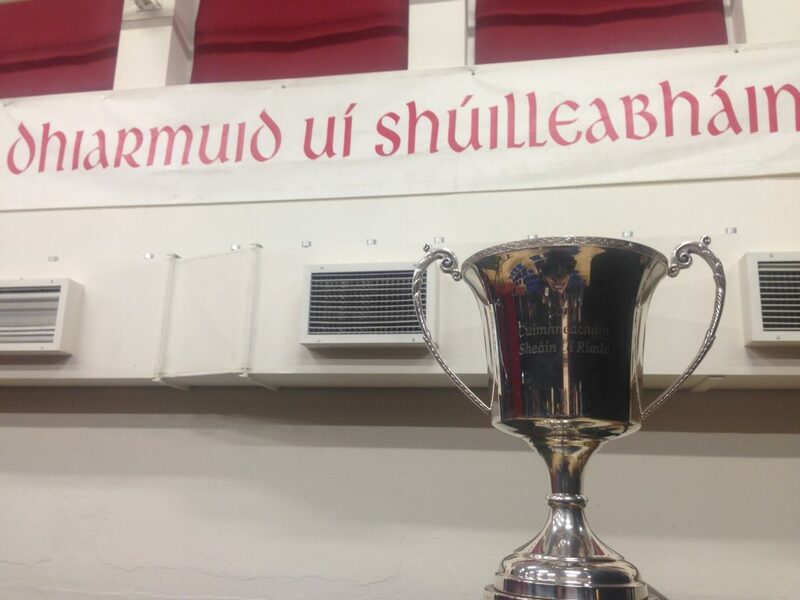 Éist leis agus bí ag foghlaim agus bí ullamh chun é a chanadh ag Club-theach CLG, Áras Abán, Baile Mhúirne ag 3i.n. ar an Sathairn ag an Ceardlann Cumadóireachta. Hup Johnny! is d’imigh sé leis ar sodar. We were delighted to receive 48 newly composed rhymes from our local schools. The Éigse Committee selected 12 of the rhymes and sent them to this year’s Éigse musicians who have put music to them. Here is a sample of one of the rhymes which Johnny Óg Connolly has put music to. Listen to it and start practising so you can sing along at the G.A.A. 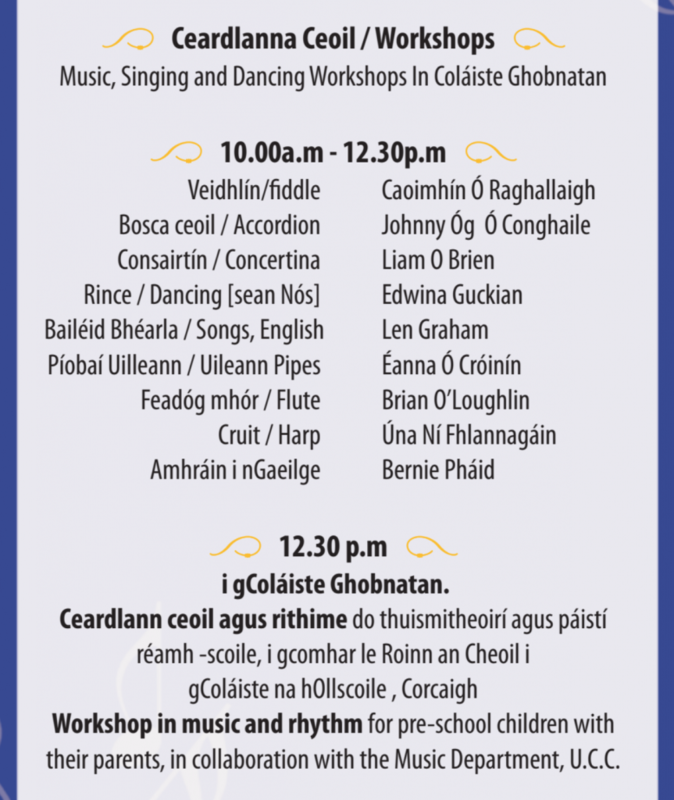 Club House, Áras Abán, Baile Mhúirne at 3pm on Saturday for the workshop. Hup Johnny! 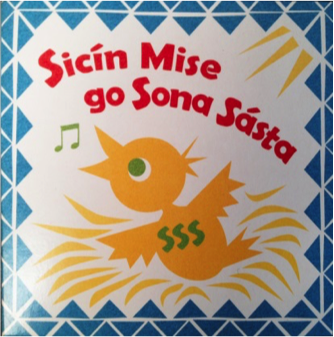 Would you like to learn a song in Irish and sing it with your child? 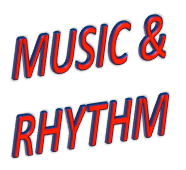 Would you like to stimulate your child’s interest in music? Or would you like to learn a few steps in the sean-nós style of dance? Workshop 1 – Learn songs in Irish with Bernie Pháid (singer on the CD ‘Sicín Mise’). All age groups welcome! Saturday December 2nd 2017. 10:00am – 12:30pm. Coláiste Ghobnatan, Baile Mhúirne. Workshop 2 – Music and rhythm workshop for parents and pre-school children with the UCC Music Department. First steps in music for the pre-school child. Saturday December 2nd 2017. 12:30pm i gColáiste Ghobnatan, Baile Mhúirne. Parents need to attend with toddlers. Ar mhaith leat amhráin a fhoghlaim as Gaeilge agus iad a canadh le do pháiste? Ar mhaith leat cabhrú le do pháiste spéis a chur sa cheol? Ar mhaith leat steipeanna nua rince a fhoglaim? Ceardlann 1 – Amhráin i nGaeilge le Bernie Pháid (amhránaí ar an CD ‘Sicín Mise’) – Fáilte roimh gach aoisghrúpa! 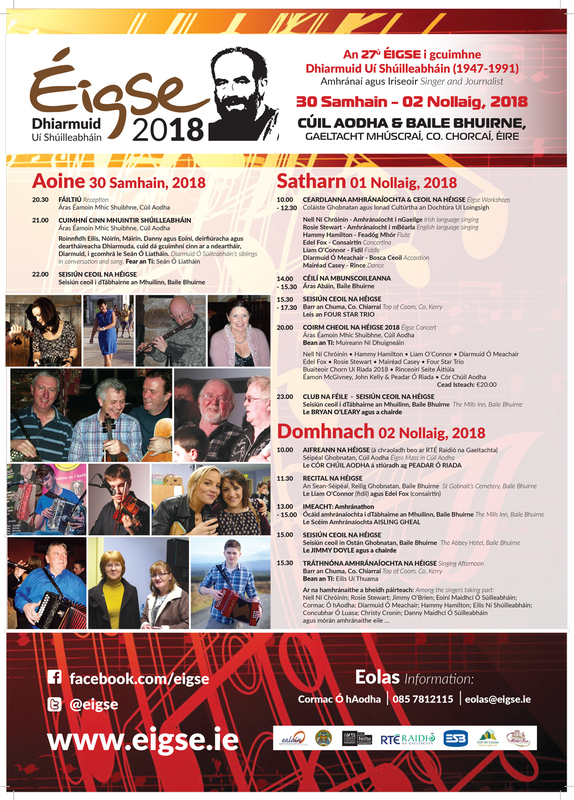 Dé Sathairn 2 Nollaig 2017 – 10:00am – 12:30pm i gColáiste Ghobnatan, Baile Mhúirne. Ceardlanna na hÉigse – An bhfuil tú chun freastal ar cheann? Éigse Workshops – Are you booking a workshop? Éilís – 087-2841220 nó Rachel – 087-2439776 Má ta aon cheist eile.